Ceramic Pro is the number one nano-ceramic coating for paint protection. 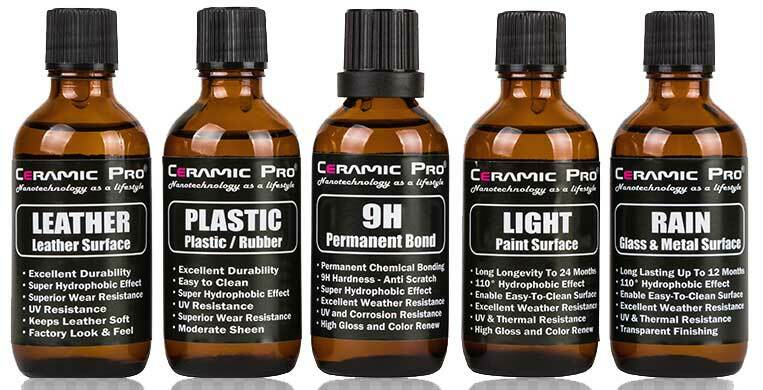 Pro 9H forms a permanent bond with the surface and will not wash off or break down. It is a highly durable protective coating that protects your paintwork from damaging contaminants. This would include acid-rain, water spots, brake dust, road film, chemical emissions, paint overspray and any other airborne contaminants. When this product is fully cured, the nano technology will transform itself on the surface to form a permanent bond 9H has 3 times the hardness of vehicle clear coat. Its a very durable flexible glass shield. The more coats applied will give your vehicle the best protection for your paint, glass, metal surfaces, interior cloth or leather, plastic and rubber parts along with a line of marine products for boats. Ceramic Pro coating will protect your vehicle paint from overspray damage.